Admission free, and all welcome, but booking is essential. You are advised to reserve a seat in advance. The rapid advance of digital technologies allows museums to make use of them in creative ways to help in developing their individual research and educational missions. The Art Research Center (ARC), Ritsumeikan University, was one of the first institutions to explore the potential and develop digital technologies in a humanities-based academic context. The ARC has been in the forefront in realising the concept of the Digital Humanities. 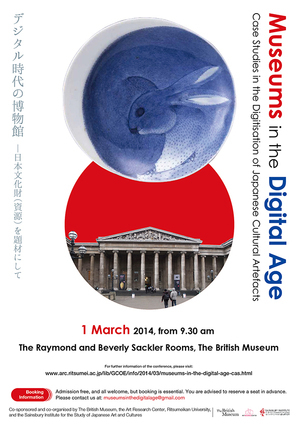 Early on the ARC established a fruitful collaboration with the Japanese Section, Department of Asia, at The British Museum, to jointly pursue of these goals. This conference will explore the ways in which the ARC and The British Museum, can build on their past successes and further develop a wide range of collaborations that will engage digital technologies to the fullest.